View the Best Tricycle for Toddlers, Below. At what age can Toddlers Ride a Tricycle? What does a Tricycle do for Toddler Development? How to find a Safe Tricycle for a Toddler? Can you get toddler tricycles with a push bar? As your child gets older, they get more restless and fiercely independent. If you are having a hard time keeping your child occupied, then the best tricycle for toddlers might just be the thing you have been looking for. Tricycles are ideal for both indoor and outdoor use and can help your child develop their mobility skills. It can also help them feel independent and confident about their skills early on. This allows the kids to bond with their parents, thanks to the level of trust that is needed to allow your child to ride alone. We have spent a lot of time researching the safest and most entertaining tricycles out on the market. During our research, we found 10 products that have stood out among others time and time again. This prompted us to review the top pick products, and a buyers guide – giving you a fully-versed review of why you should invest in those particular tricycle and no other! The following list includes all of our favorite tricycle products. They are the safest, best-looking tricycles that have been tried and tested by hundreds of kids. Many parents and children have been very thoroughly satisfied with the following products, marking them as reliable and fun with dozens of 5-star reviews. Want to go electric? Try an electric trike. Radio Flyer’s little red wagon has been the trademark of the word ‘fun’ for over 100 years. Now, nearly 12 decades later, Radio Flyer hasn’t stopped keeping kids occupied, happy, and independent. You have undoubtedly already seen the popular red-wagon that has been featured in hundreds of black and white pictures in the 1920s. After the success of their red wagon, Radio Flyer has made it their goal to keep producing ride-on toys, including tricycles, for even the youngest audiences. One of the most popular tricycles from this company is the 4in1 trike. There are five style options to choose from when buying this little tricycle, and that’s what makes it so appealing to parents and kids alike. You will be able to include your child in the process of buying the new tricycle, presenting all the options to them, allowing them to be involved in the purchase. With over 2,000 reviews, this product is one of the most sought-after tricycles. It’s definitely thanks to the versatility and the grow-with-the child feature, which makes the product well worth the money. There are five designs to choose from when buying this 4in1 trike: the classic, folding, infant, sport and ultimate kids tricycle. 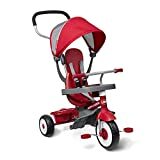 It has the trademark red-color that is well associated with Radio Flyer, and a small canopy over the baby-seat that prevents the sun from making your toddler too uncomfortable. The beginning stages of trike include a grow-with-me seat that evolved along with your child. There is a comfy safety tray that comes with a cup holder and allows your child to sit upright without any discomfort. This is of course removable, and as your child grows and develops, they won’t bee needing as much support. The reason as to why so many parents flock to buy the 4-in-1 trike is because of its versatility and grow-with-me features. It’s a very inexpensive product that will last your child for 5+ years, allowing your child to have a sense of consistency as they improve their mobility skills. You can put your toddler into the trike as soon as they turn 9 months old! The trike can be adjusted and ridden for about 5 years, at which point it might get too small for a 6 year old. Regardless, it’s the ideal toy if you have kids between the ages of 1-5 year that need some entertainment! The product is about 19.9 x 35 x 40.8 inches and weighs 15.23 pounds. The trike can be configured to suit your child at any given age between 1-5 years old and is the perfect size for any eager toddler learning to ride. Schwinn is possibly the oldest company on our review list today. It was founded in 1895 and has been producing well-loved bicycles that have provided all-around fun for everyone for decades. The company was founded in Chicago, Illinois, and one of their main goals has been to provide their customers with reliable products that can help them discover the joy of bike riding. Although the company is mostly known for manufacturing bicycles for adults, they have also taken to making tricycles for kids. The product that we will be looking at is the Schwinn Roadster 12inch Trike. Amazon has gone as far as to make it their Amazon’s Choice products, and among the sea of 5-star reviews, it’s easy to see why. It’s a very original tricycle that attracts attention from the get-go thanks to the original and unique design. It can be hard to make interesting-looking products nowadays, but Schwinn manages to do so without any trouble. The retro-style is definitely one of the things that drive so many kids and parents into buying this product! This Schwinn Roadster 12inch Trike has a very particular vintage-retro look and is available in over 8 colors. No matter how fussy your child may be, they will surely find a design for themselves among this selection of choices. The wood deck that is attached at the back with the burned-in logo is the ideal example of good, original designs. Thanks to the tricycle having a design that is close to the floor, it will give your child a lot of balance and confidence. When they ride, they will be able to fully rely on the tricycle to take them where they want to go without any accidents. The Schwinn Roadster 12inch Trike has a low-center of gravity that will help prevent the tricycle from tipping over when going at higher speeds. The long chrome handlebars allow the child to have full control over their ride, too. The steel heavy-duty construction is another reason as to why this tricycle is one of the sturdiest designs out there. This tricycle is ideal for kids between the ages of 1-5. It’s just as versatile as the Radio Flyer tricycle, and a 2 year old can already very easily reach the pedals. As for 5 year olds, they will find the tricycle fully comfortable and fitting, especially with the seat set further back. The product weighs about 22.5 pounds and the dimensions equal to 12.5 x 14.2 x 24.7 inches. The adjustable seat will help alter the size and fitting of the tricycle for either younger or older children. There are many tricycles out there that have extravagant designs that sometimes makes the trike difficult to ride. Most often they are not foldable, either, and you can’t take them on trips with you. Chromo Inc was aware of these problems, and that’s why they decided to build a tricycle that will be simple, foldable and reliable. That’s how we got the Fly Bike Glide Tricycle, which now has over 1,500 reviews, and full 5-star opinions. Children have been loving this tricycle for years and have experienced many happy moments with this happy-looking little product. The Glide tricycle is designed to help your child develop their skills as they grow. If you have kids that are not fully capable of walking yet, or kids that need some new entertainment in their lives, then we can wholeheartedly recommend buying this Fly Bike. It can help your child to build strength in their legs as they scoot along, and help them develop a good sense of balance. If your child can’t walk yet, they can also use the Fly Bike as support to learn to ride then walk, holding it and walking side by side. The design of the Fly Bike Glide Tricycle is one of the simplest designs we’ve seen yet. It has no useless accessories attached to the front, sides or edges and is meant to be used solely for riding, scooting along or learning to walk. This is one of the safest ride-on toys. Being made of plastic, the ride-on won’t be dangerous if the child happens to fall over. The light but sturdy frame allows for easy mobility, and the toy can be taken anywhere, thanks to is light-weight. The Fly Bike doesn’t require any assembly, which makes for a quick and easy purchase that your child can start using from the get-go. You can also fold up this lightweight tricycle and take it with you on any trips and excursions. This tricycle should be ideal for kids up to 1 year old. It will help your toddler develop all the necessary mobility skills that they will undoubtedly help them in riding more advanced bicycles! The tricycle weighs about 3.75 pounds, which means that even if the tricycle falls on you or your child they won’t be crushed! Fischer-Price is undoubtedly one of the most popular brands selling toys today. They have been around since the 1930s, and since the very beginning they have been making quality products to help kids learn the essential life kills, like walking and playing. After so many decades, the company knows what kind of products kids gravitate to, and they make their toys accessible to kids of all ages. Since their earliest days, they have been taking customer feedback and improving all of their merchandise, and that’s one of the qualities that separates Fisher-Price from other companies of the same caliber. The Rock, Roll ‘n Ride tricycle is a fun, action-packed product that will help keep your child occupied in their outdoor excursions for months. The tricycle is also a parent-favorite and has been named an Amazon’s Choice product. Sporting over 500 positive reviews, this little toy is sure to help your child develop their mobility skills in no time at all. You don’t need any tools to put it together and it’s very easy to convert to more advanced stages as your child grows. Right from the get-go it’s easy to see that the tricycle has a sturdy, reliable design. It’s much thicker than the previous tricycles we listed, and that makes it more balanced. This allows a child to scoot along with confidence, knowing the tricycle won’t tip over. The seat is modeled in a way to help the child feel comfortable and safe. The handlebars are thick and will allow your child to have a solid grip that will help them to steer the tricycle easier. The wheels are also thick to help the tricycle have a better center of gravity on the floor. One of the best features of Fisher-Price’s tricycle is its ability to grow with your child. It has 3 stages: a rocking toy for young kids, a rocker with a push along to help your child move along and finally, the stage where your child can pedal the tricycle on their own. Thanks to the grow-with-me feature, this toy can stay and grow with your child for over 5 years! It’s ideal for kids as young as 1 and for kids as old as 5, thanks to all the grow-with-me stages. This tricycle weighs about 15 pounds and its dimensions are about 12.5 x 15.2 x 27.1 inches. Besrey is a company that originated in Germany and has continued to expand to a handful of other countries. That’s a huge achievement for a company that is only 7 years old, and it’s no secret that their products help promote their success. They devote all of their time and passion to help keep kids occupied from the youngest years right up to preschool. They have brought several revolutionary concepts to the market, and the Besrey 3-in-1 is one of those fashionable products that have been loved by kids worldwide. All of their products are fully functional and are meant to help your child develop all the necessary mobility skills that are vital as the kids progress. Their goal is to put the toddler’s safety and comfort first, and that’s why all of their products are designed in a way to help keep your child safe, but entertained. No matter if you put the tricycle on a pavement, a dirt road or gravel road, it will allow your child to move along confidently and without a worry of tipping over. The design of the Besrey 3-in-1 is very sporty and should attract any active toddler to try it out. It also comes in 3 colors: black, blue and red. Essentially, it looks like a normal sport bike, but has only three wheels and is known as one of the best tricycles for toddlers ages 1-3! Thanks to the front wheel of the tricycle being significantly bigger than the back wheels, it provides much more balance to the product. It’s extremely easy to use and no matter what kind of environment you put it in, it will scoot along faithfully. The Besrey has removable pedals, which encourages younger kids to sit on it and use it a ride-on walker. As soon as your child grows older, you can add the pedals and have the toy turn into a simple tricycle. The flexible plastic encourages safe play and the tricycle itself is very easy to assemble. The tricycle is ideal for kids between 1-3 years old and is very lightweight, which means that even if your child tips over, they shouldn’t get any bruises from the trike. The trike weighs about 7.7lbs, and when folded has the dimensions of 11.8 & 12 & 20.7 inches. When folded out, it sums up to about 25.39 & 15.74 & 19.6 inches. Once again Radio Flyer makes its way onto our list, this time with their simple, red tricycle. Over the decades, Radio Flyer has given parents an opportunity to help their little ones develop with toys and ride-ons, just like this fashionable tricycle. Upon the first look, we can already see that this trike is modeled to fit the image of old, vintage classic red toddler trikes. This will give a good sense of nostalgia to parents, and an exciting new world to explore for the child. Over the years, Radio Flyer has noticed that tricycles are either too thick in design, or too thin. This can be a problem since both designs, if exaggerated, can cause the trike to tip over and hurt the child. To combat this, Radio Flyer has made it their goal to make a perfectly balanced tricycle for kids. They have managed to do that with this Red Rider. It’s easy to carry, thanks to the seat that has a grip at the back that looks like it’s part of the design, and it’s rather lightweight. All of these features will help you to carry this little trike wherever you go with your child to help keep them occupied! The design of the Red Rider Trike is very friendly and engaging. It has a lot of curves, sturdy steel frame – the shiny wireframe looks very inviting. Included in the design is a storage bin located on the side, next to the seat, to allow for extra fun. This is the pinacle of the classic tricycle! Thanks to the steel construction, this trike is made with very sturdy steel and rides quietly both on pavements and dirt roads. The handlebars allow for very responsive steering so that the child can fully control their riding experience. The tricycle comes with a grip that is located on the back seat that allows the parents to easily pick up the trike and carry it when the child gets bored or tired. The seat on the tricycle is fully adjustable and can grow with your child over the years, and the wheels don’t make any aggressive noises when riding. This Red Rider trike by Radio Flyer is ideal for kids between the ages of 30 months to 5 years. The Red Rider only ways 10 pounds, which is relatively little for a steel-framed tricycle, but that’s why it helps keep the toy safe. The dimensions of the product itself are about 22.2 x 27 x 21 inches. Radio Flyer has been known for their fiery red wagon that originated in the early 1900s. However, the company has also decided to expand their horizons by producing a line of tricycles. Since they know that not every boy and girl likes red, they decided to release a line of toddler trikes that have various painting jobs. This one in particular has a very light pink color and has been manufactured to suit girls who wanted a more personalized experience when riding their tricycles. The shiny pink push handles and the compact, yet interesting appearance of the tricycle is sure to invite any eager toddler to try it out. The trike has also been designed to allow the child to have access to all of the necessary accessories and features that it possesses. This allows for play that is both educational, easily accessible and entertaining. It allows the kids to have full control over how they play and the skills they acquire. It also helps the children gain confidence, focusing on them learning the necessary mobility and balancing skills that they will need later on in life. This particular tricycle by Radio Flyer is painted in a light pink color and has fashionable chrome handlebars along with a ringing chrome bell. Thanks to the front wheel being 12” tall, your child will also have more balance when riding. The push handles are very responsive to movements and have a wide turning radius that encourages stability. This ensures that your child will be able to ride safely and confidently along the roads without tipping over. The trike comes with an adjustable seat, that allows your child to grow along with their new toy. This helps the child develop a sense of reliability and trust, which are vital virtues to have as the child keeps learning. This tricycle is ideal for kids aged between 24 months and 5 years of age. Since this is such a broad spectrum, we think that this trike would be ideal for both a home with a single child, or a child with many young siblings! The trike weighs about 15.5 pounds and measures around 24 x 9 x 13.8 inches. It’s a great tricycle to have in the garage or in the hallway thanks to its compact size. High Bounce is a company that has been producing high-quality toys for several years now. The High Bounce company want all kids to have access to affordable, well-produced and safe toys. Guided by passion, High Bounce has produced hundreds of products for toddlers, kids, youths, adults and seniors. Through this process, they have managed to find the best features that suit every quality product. The High Bounce extra tall tricycle is a fantastic example of one of these quality products that have been modeled to look great and be safe. It’s a very simple product, but the design of the wireframe is significantly different from the previous kids tricycles that we have reviewed on the list so far. It’s also taller than regular kids tricycles, which allow the taller toddlers, enjoy and grow along with their favorite toy. Every parent knows how hard it can be to separate a two-year-old toddler from a toy that they have had all their life, and that’s why High Bounce made sure to make this tricycle as adaptable as possible. The High Bounce Extra Tall Tricycle for kids has one of the friendliest designs we’ve seen so far. It has very inviting colors, and the round shapes that are common all throughout the design should invite just about any kid to play. Thanks to the sturdy triangle wireframe and durable EVA tries that are fully slip resistant. This helps prevent your child from slipping on even surfaces when they speed past you. The tricycle has a metal frame for extra stability and all the features are made of top quality materials that are tested and safe. The assembly of the product is very easy and you can even get your child to help along. The push handles allow for an easy grip and the pedals can be easily reached from the elongated seat. This trike is ideal for children between the ages of 3 and 6. It’s ideal for kids that have grown out their small tricycles and need something more advanced! The trike weighs about 11.5 pounds and is 2 and a half inches taller than the usual tricycles you see sold out on the market today. Here we have yet another tricycle from Fisher-Price, which is another sturdy trike that allows your little ones to scoot along confidently. Since the very beginning, Fisher-Price has been putting a lot of emphasis on providing kids with safe and reliable toys. For years, they have asked their research teams to put in 100% of their time and effort into finding what features and qualities a reliable tricycle should have. After all of the research, Fisher Price came up with the Grow-With-Me trike. Like many of the previous trikes that we listed, it grows with the child over the years and allows them to keep evolving. The adaptability and adjustability of this tricycle is a great buy especially for parents that have several young children. It can allow them to learn to ride, share, push their sibling on the trike and encourage teamwork and patience. No matter if you’re indoors or outdoors, you can take the tricycle with you and allow your child to ride by your side wherever you go. The steering is very responsive and the tricycle itself is very strong and has quite a bit of weight capacity! Just like the previous trike we listed from Fisher-Price, the thick, sturdy design of this trike is ideal to help kids develop a sense of confidence. It comes in a light blue color with dark blue and pastel green and orange accessories that blend very well together. No matter if your child is 1 or 5, they will be able to ride on toys, regardless. With the removable pedals, you will be able to let your 1 year old ride the tricycle without their feet getting caught up in the pedals. Just like many of our previously listed products, the grow-with-me feature is by far the most sought-after feature in kids tricycles. It lets the child grow attached to the trike and that will help them feel confident as they grow along with it. This tricycle is perfect for kids between the ages of 24 months and 5 years old. The Grow With Me trike weighs only 1 pound, which ensures that your child will not be hurt should they flip over and have the product fall on them. The dimensions are about 19 x 29 x 21 inches. Last but not least, we have another product by Radio Flyer, this time a tricycle with a very original design. It doesn’t resemble any of the toddler trikes that we’ve seen so far on this list, since the seat is considerably lower. This adjustment allows the child to lay back more, allowing them to be at a level with the pedals. This allows younger kids to have way more coordination over their movements. In typical tricycles, the child usually has to be big enough to reach the pedals. As we all know, toddlers come in all shapes and sizes, and this design helps all of them to comfortably reach the pedals. Radio Flyer has made it their goal to provide even the youngest kids with entertaining toys, one of them being the Grown n’ Go Flyer. It’s easy to adjust, and expands as your child grows. This ensures that you will keep your child occupied through all of their toddler years. The wheels also flow great on all kinds of terrains, from dirt roads to pavements, and that’s what makes them so accessible and well-loved by both parents and kids. This is definitely one of Radio Flyer’s more original designs. The wireframe is designed in a way to have the child almost lean back on the tricycle.The colors of the trike are red, white, chrome and black and it definitely has the vintage look and feel to it. The seat on the tricycle is very low, just above the floor, which allows the child to easily reach the pedals and steer with confidence. This design also makes it almost impossible for a child to tip over unless they are pushed or drive off a curb/over a bump. The tricycle is fully adjustable to suit toddlers of all sizes and age ranges. There are also a small number of storage compartments right behind the seat that allows the child to store their favorite toys when they go out on a ride. This tricycle is perfect for kids aged between 24 months and 5 years of age. All in all, it’s a great product that will grow with your child. The tricycle weighs about 9 pounds and measures 14 x 18 x 6.2 inches before being adjusted. It can carry about 50lbs of weight. The older your child gets, the harder it is to keep them entertained. Maybe household toys just aren’t doing the trick anymore, and you need to introduce something new to your toddler’s daily playing routine. If your child still needs to work on their mobility skills or just like ride-around toys, then we can wholeheartedly recommend purchasing a tricycle for your little one. Tricycles are a great way to encourage and instill independence in your child from a young age. Not only that, but you won’t have to force your child to walk long distances anymore, either. Whether you need to go to the local store, a neighbor’s house or your job, you can take the tricycle and have your child scoot along. It’s a fantastic means of play, learning and fun. There are hundreds of companies out on the market that want to sell you their product. If this is your first time buying a tricycle, then all the features, company names, accessories etc. may get confusing. To help you with your first tricycle purchase, we decided to compile a small list of features that you should look for and pay attention to when you buy your child their first trike! Every tricycle has its own, unique design. All the color schemes are different, and the build of the wireframe varies from product to product. We recommend deciding beforehand what kind of wireframe would be ideal for your toddler. For example, Radio Flyer has kids tricycles that are very close to the ground, where the seat is at level with the pedals. This allows younger toddlers to easily lean back, reach the steer and the pedals without worrying about tipping over. Young toddlers who don’t have as much sitting balance as other kids may find this tricycle much easier to maneuver than other alternatives. For older toddlers, there are more classic tricycle wireframes, that require a bit more balance and control. The seat on these is usually much higher off the ground and the push handles are longer to help enable easy steering. It’s important to decide what kind of color scheme your child likes before purchasing the product. The easiest way to do this is to take your child to the local toy store and show the toddler trikes available there. Once the decision has been made, you can rest assured that when you go back online to search for the ideal trike, you will know exactly what to look for. Each tricycle has a different design. Some are bulkier, made of steel or metal frames, and some are thin and made from plastic. They key is to identify where your child will be using the tricycle most. Is it meant to be an outdoors or indoors toy? For outdoor kids tricycles we recommend purchasing a tricycle that has a steel or metal frame and rubber tires. This will ensure that your child can ride both on gravel and dirt roads without worrying about the tricycle getting damaged. Even those these trikes are usually heavier than their plastic alternatives, you can be by your child’s side each step of the way to prevent them from tipping over or save them from bumps on the road. If you are planning on having an indoors tricycle for kids, then we recommend something that is light and made out of plastic. It will be easier to carry around the home, and if it falls on your child when they are playing alone it shouldn’t cause any damage. Each tricycle has its own distinct feature/s. Some are simple and just meant for riding, while others offer additional play features. Some common accessories in today’s toddler trikes include: a ringing bell, storage spaces (i.e. a box, bin or cupboard), additional seats for extra passengers, steps, stickers etc. One of the most popular tricycle for kids features includes the ‘Grow-With-Me’ function. Essentially, it allows the tricycle to grow with your child. Usually, the trike can be extended and adjusted to fit the child’s height as they grow. Some tricycles are meant to take your child from 1 year-old oriented play to 5-year-old bike play. That means that a tricycle, in its first stage, can be converted to a rocker, where your child learns to balance on the seat as they rock back and forth. Later on, you can convert the rocker to a pushable tricycle for kids, where you push your child as they learn how to pedal. Finally, after the second stage, you can convert the tricycle to the typical trike design, where your child can ride on toys on their own without any need of pushing or assistance from the parent or carer. Each tricycle is suitable for ages that are specified by the retailer. Some tricycles are meant to be used by 1 year olds and have features that cater towards that age group specifically. There are also trikes that are meant for older kids, ages between 3-6 years old. These tricycles usually are taller and are made from materials such as steel and metal. It’s important to get a tricycle for your child that suits their age group. Buying a tricycle for a 1 year old that is meant for 3 year olds will only discourage the child, and possibly cause more harm than good. Making sure to purchase a suitable tricycle for your child is vital, since you can make sure that the toy will help your child develop as they grow. Later on, you can buy them more advanced trikes, but it’s important to start simply to help the child get used to the new toy. Kids can start riding a tricycle as young as 1 year old! However, it is recommended to make sure that the child has good balance skills before putting them on one. Many tricycles are tall and can be heavy, depending on the build of the frame, and if your child tips over they may get a few bruises. We recommend light, plastic tricycles that can be first used indoors to help adjust your child to the new toy. First of all, it’s important to make sure that your child is interested in trying out a tricycle. Most kids are, but some toddlers can be scared of them, especially if they don’t have good balancing skills yet and tip over early on. Once you make sure that your toddler is eager to try and learn, you can put them on the seat and have them scoot along. Don’t have them put their feet on their pedals at first, have them glide along the road or floor so that they get used to the balancing. After a few days of gliding, your child should have already learned to steer and go towards a desired direction. Then, you can introduce the pedals. At first, your child may struggle, since they will have to focus on balancing, steering and pedaling at the same time. After a few hours, however, they should get the idea and start speeding along the path fearlessly! Tricycles are a great means of transport for a young toddler. Everyone knows how fussy toddlers can be when they have to walk, and giving them a tricycle instantly makes trips and walks easier. Regarding toddler development, a tricycle can help your child develop strong motor skills. They will be encouraged to develop their hand-eye-feet coordination skills, as well as basic mobility skills needed for every day life. It’s important to look at the reviews. Parents usually point out all of the flaws of the tricycles that they purchase to help inform other parents about any defects in the design. All safe tricycles should have a wide seat, a sturdy frame, responsive push handles and smooth ride wheels that move smoothly among several surfaces. Of course! There are plenty of toddler tricycles that come with a push bar. Most of the time, the push bar is also removable, which is a great feature, since as your child gets older you will no longer have use for it. One of our favorite tricycles for 2 year olds is Radio Flyer’s Grow ‘n Go Flyer. Not only does it have a sturdy build, but an attractive and lively color scheme, too. The seat is close to the ground, leveled with the pedals, which allows 2 year olds to comfortably ride their tricycle without worrying about tipping over. This trike will help your kids develop a sense of confidence as they learn to pedal and coordinate and steer tricycle with push handles. Tricycles are a great way to help keep your children active. Whether your kids are tired of their day-to-day toys, or if they want to be like their older siblings that are already riding bicycles, a trike can be a dream come true for a toddler. It can help them track longer distances with their family and they won’t have to walk everywhere, and you won’t have to carry them! A tricycle is a great toy that will encourage independence and help develop advanced mobility skills. These skills will undoubtedly be extremely useful as your child grows and will move onto riding regular bicycles. Choosing a tricycle can be difficult, especially since it may seem like your child’s tastes change from day to day. On Monday they may like the blue tricycle, and on Thursday, the purple one. Regardless, the most important thing is to choose a trike that is safe. We hope that our reviews and article left you a bit more informed about the different types of toddler tricycles and their features and that you will find the perfect tricycle for your child! It’s important to teach your child to balance before you put them on a tricycle. This will ensure that they won’t tip over and hurt themselves later on! Balance bikes are a great way of helping your child learn to balance. Tricycles were first introduced to the general public in the 1650s! This happened when Stephen Farffler, a disabled man, wanted to keep being mobile around town and his home. Read the study on how tricycles can help with disabilities here.